Far from the hedonism and tourist masses in the south; northern Thailand retains the authenticity and rustic charm that originally crowned the country as “The Land of Smiles”. The people are friendly, the food is incredible, and the scenery is dramatic. If you spend any amount of time here, it’s impossible for it not to be a transformative experience. This is just one of those places that sticks with you, long after you leave. When most people think of northern Thailand they think of Chiang Mai and its legendary lantern festival. 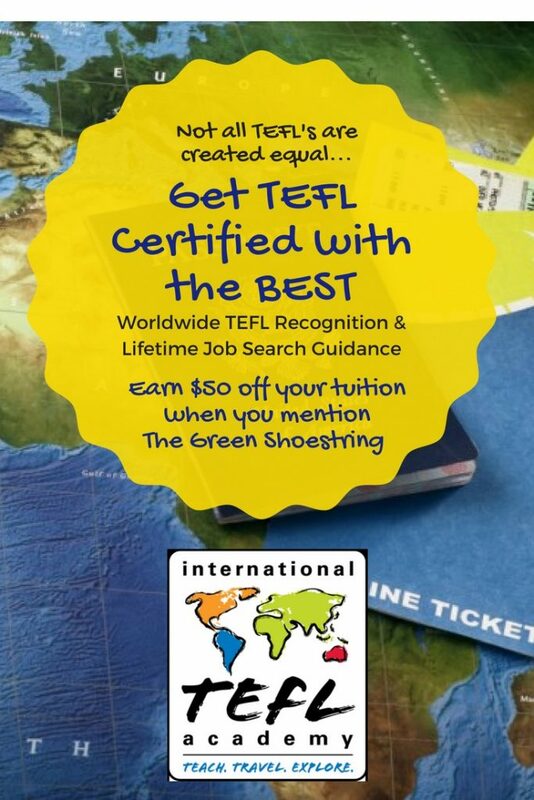 But Chiang Mai is only the tip of the iceberg when it comes to north Thailand. The best way to fully experience this incredible region is to hop on a motorbike and set out for some of the most remote and unspoiled parts of Thailand via the Mae Hong Son Loop. 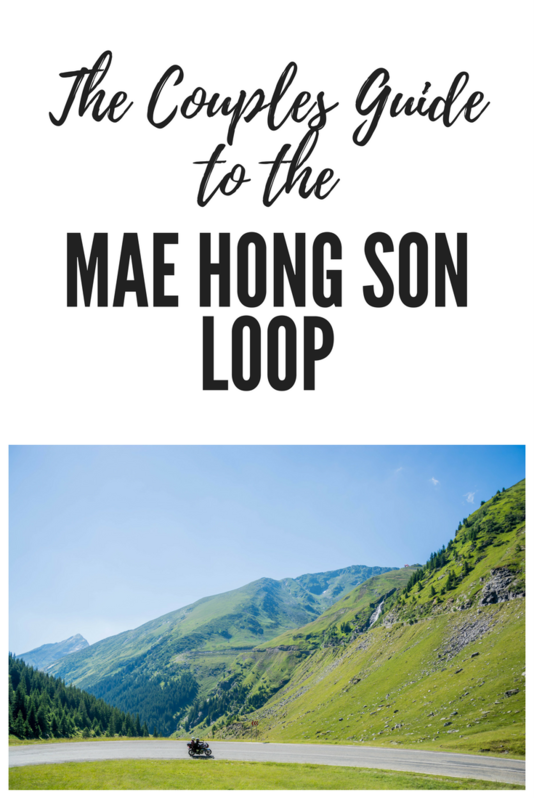 What is the Mae Hong Son Loop? 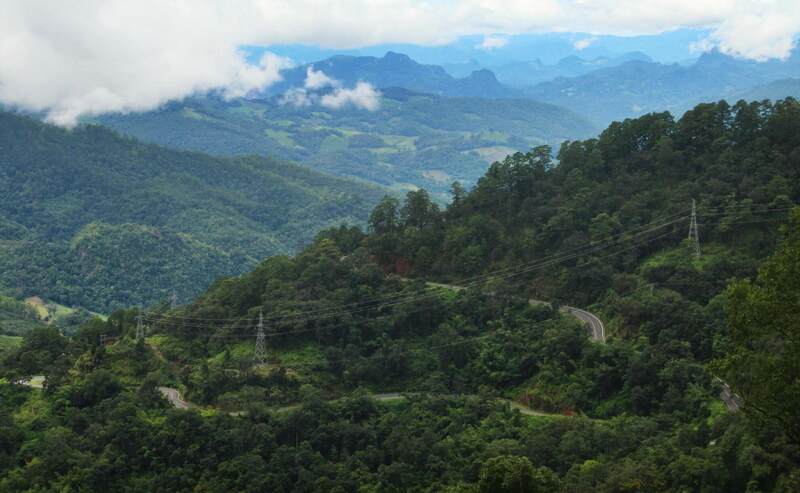 The Mae Hong Son Loop is a 600km journey through the Mae Hong Son province of northern Thailand. The loop starts in Chiang Mai and passes through the three main towns of Mae Sariang, Mae Hon Son, and Pai. Along the way, you’ll drive through national parks, past rolling farmland, over mist shrouded mountains, and beside vibrant rice fields. 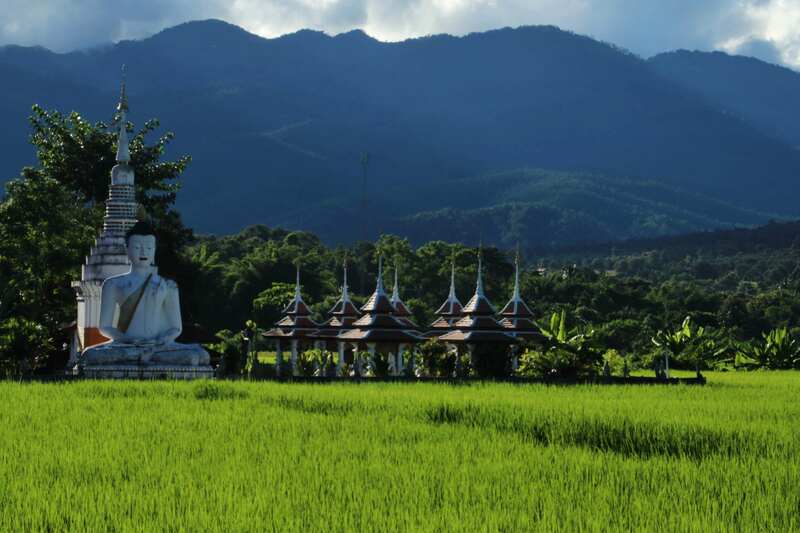 At each stop on the Mae Hong Son Loop there are numerous opportunities for exploring. You can camp in national parks, hike to caves, waterfalls, and hot springs, trek through jungles, and raft down rivers. Each city on the loop has its own unique culture and feel. If outdoor adventuring isn’t your thing, you can relax and enjoy the friendly vibes of these north Thailand towns. The following guide will tell you everything you need to know about driving the Mae Hong Son loop as a couple, riding together on one scooter. 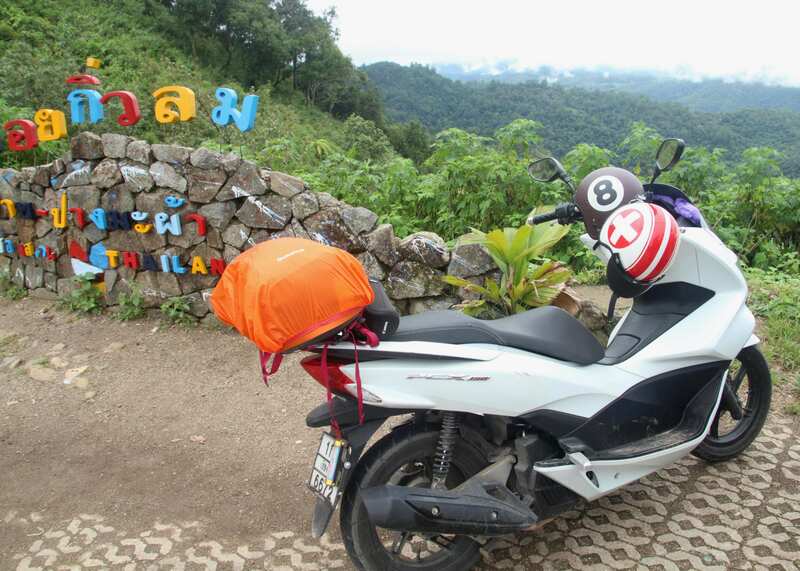 When driving the Mae Hong Son Loop as a couple, you have two transportation choices: take one motorbike or two. Everything we read said to take two scooters, but after our experience crashing on Bali, we were uncomfortable with the idea of driving separately. After much debate, we decided to drive the loop on one scooter. –We could take turns driving. 5 hours is a looooooong time to be on a scooter. It can be mentally and physically taxing. Taking one motorbike allowed us to drive in shifts, giving us both opportunities to rest, and enjoy the scenery. –We always had one driver and one navigator. The driver never had to look at his/her phone for directions. –There was no chance of getting lost or separated. If anything were to happen, we’d be together to problem solve. -Ashley was still uncomfortable driving in the mountains after her crash, so I could drive down the steep roads. -If you take two bikes, you have that many more moving parts, and that much more possibility of a scooter breaking down. We looked at several different sizes of scooter from different shops, before settling on a Honda PCX 150cc scooter from Tony’s Big Bikes. 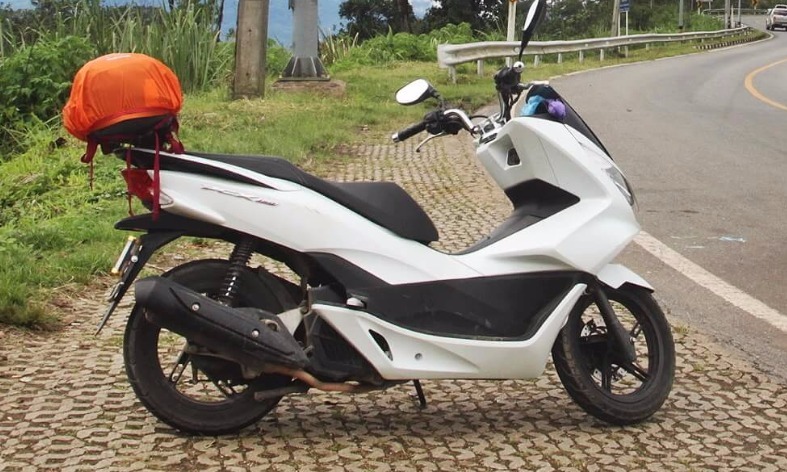 The Honda PCX is a big scooter with a big engine (150cc), big tires, and powerful brakes. It has two large, comfortable seats and more than enough power to get up the steep mountain roads; especially those between Mae Hong Son and Chiang Mai. We cannot stress enough the importance of comfortable seating when choosing a scooter for this trip. You will spend hours perched on the motorbike when driving between cities. Uncomfortable seats can absolutely ruin what would otherwise be an amazing trip. The Honda PCX scooter is also incredibly safe. It was pouring rain on the first day of our trip; we were driving down the steep, windy road to Pai as rivers of mud flooded onto the pavement. The scooter handled the slick roads like a champ, we never once felt out of control. An added bonus of the scooter is the large storage compartment under the seat. It allowed us to put a lot of stuff in the bike and only have a small daypack bungeed to the back. This scooter has a ton of features, and consequentially, it’s more expensive. We paid 500bht/day for the scooter rental with full insurance, and it was worth every baht. If you can afford to pay a little extra, I would highly recommend going with this motorbike. If 500bht/day is out of your price range, you can rent a smaller scooter from Mr. Mechanic: another reputable rental company in Chiang Mai, to the tune of 250bht/day. The motorbikes at Mr. Mechanic are fully capable of driving the loop, but be advised that a smaller scooter will be less comfortable and more likely to break down. The drive to Pai is the one of the shortest drives of the trip, so you can ease yourself into driving, building up to the longer rides later on the loop. Pai is an awesome city to hang out for a few days or a few months, so if things go wrong early you can bail on the trip and just hang out there. We weren’t totally sold on the whole idea of riding on a bike together for 600 kilometers, so we went with route B. That way, if the first day totally sucked, we could scratch our plans for the loop and just hang out in Pai. Looking back, we wish we would have gone with Route A. Pai, and the drives to and from Pai, are some of the highlights of the trip and are best saved for last. The bare minimum that you can complete the loop is four days. We don’t really see why anyone would do that though. You would be driving all day for four straight days; where’s the fun in that? We think that the very least amount of time you can allot for the loop is 7 days. That way you’ll never have to drive on consecutive days, and will have one full day to explore the area around each city. We did it in 8 days and felt like there was a lot of stuff we didn’t have time to do. 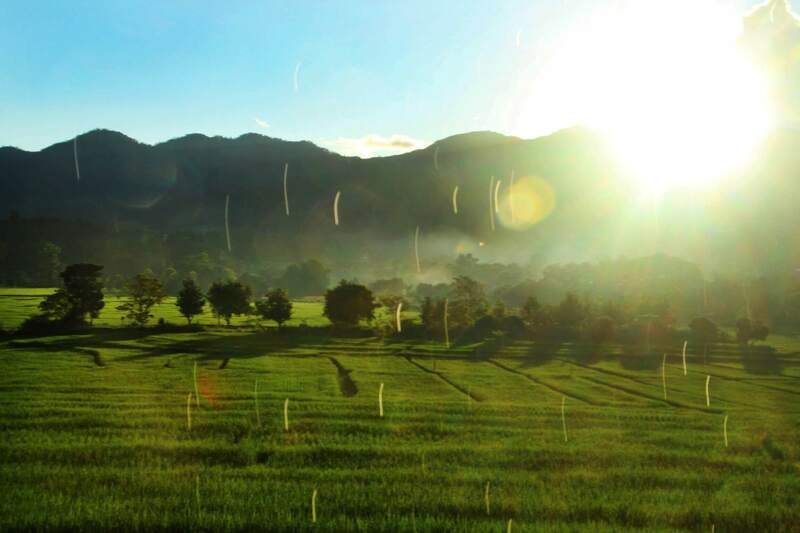 If time is no issue, give yourselves two weeks or more to fully enjoy everything Mae Hong Son province has to offer! Everything you bring has to fit either inside the scooter, on the scooter, or on your back; so it’s important to pack light and bring only the essentials. More stuff equals more weight, which means less fuel efficiency and more difficulty controlling the motorbike. Most hostels in Chiang Mai will store your big bags, and you’ll have opportunities to get laundry done in each town you stop in. We fit everything for our trip into the bike storage compartment, a 32L pack bungeed to the back of the bike, and two small day packs. It’s inevitable that it will rain at some point during your trip. We strongly advise that you put a pack cover on your bag to keep everything dry when it does eventually rain. If you don’t have one, there is a Decathlon sporting goods store on your way out of town towards Mae Sariang, where you can buy a cover for any size pack for around $10US. This is a better option than covering your pack with a trash bag. Once that trash bag rips (which it will) you’ll have to throw it away. Pack covers are more durable and will last for years of adventures. We stopped at a café on top of the pass which had gorgeous views looking out at the surrounding mountains. Shortly after getting back on the road it started raining, HARD. We’re talking full on deluge. It was raining so hard we could barely keep our eyes open as we crawled down the mountain. Our decision to go with a nicer scooter was instantly gratified as we had no problem navigating the slick road conditions. We finally rolled into Pai sopping wet, and happy to be done driving for the day. In all, the trip took about 3 and half hours, but would have taken much less in better weather. Pai. Where do I even begin to describe the beautiful anomaly that is Pai. 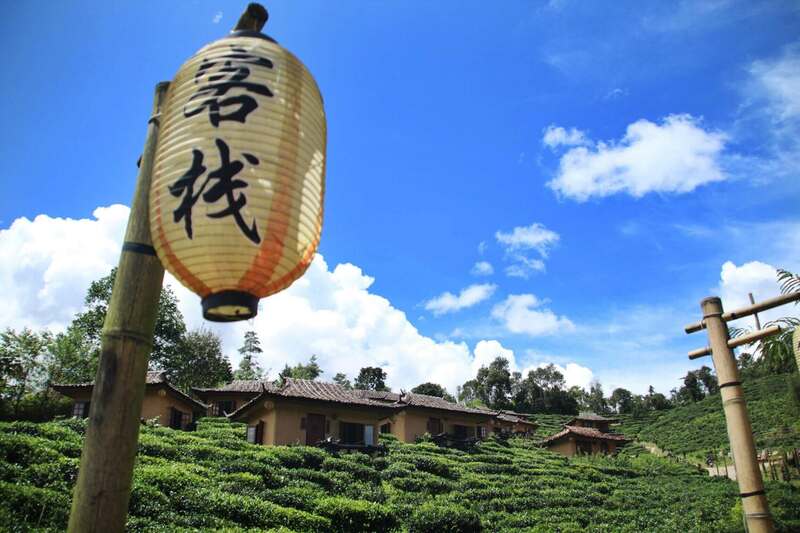 Pai is a hippy haven nestled in a valley of verdant rice fields. Don’t be surprised to see locals and expats alike sporting dreadlocks and walking around barefoot. The people here are incredibly friendly and you’ll be met with smiles and good vibes everywhere you go. 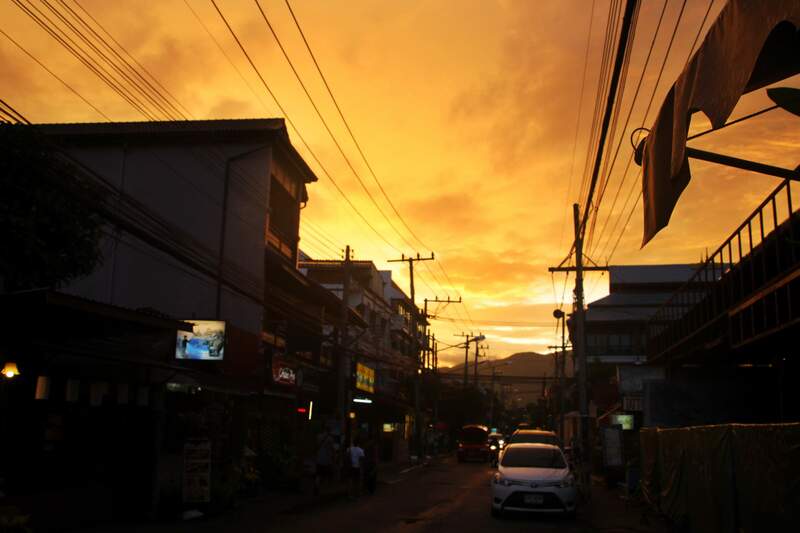 Pai also has a night walking street with some of the best street food in all of Asia. Everything from spring rolls, to samosas, to bacon mac n’ cheese lasagna. The night walking street is an absolute can’t miss! After a rainy start to our trip, we were graced with two days of the most immaculate weather. We arrived in late September, about a month before harvest season. Stalks of rice towered in the fields and painted the countryside in the most intense hue of green we have ever seen. It was as if someone turned the saturation (in our eyeballs) ALL the way up. We continually rubbed our eyes in disbelief that such a shade of green could exist in nature. Huge, billowy, white clouds floated lazily overhead, and time seemed to slip lazily on with them. We spent the first day driving through the countryside, stopping frequently to take pictures. We enjoyed snacks and smoothies at some of the countless roadside cafés before ending the day at Pai Canyon. The second day we did some kombucha tasting, before going on what the staff at our hostel fondly called “the mushroom walk”. The walk is a path; popular with locals amidst psychedelic experiences, serpentining through exuberant rice fields and ending at a beautiful temple. After the walk, we watched the sunset from the giant white Buddha atop a hill outside of town, capping off a truly magical two days in Pai. I cannot say enough good things about Deejai Pai. It’s one of the nicest hostels we’ve stayed at in Asia. It’s a little on the expensive side for Pai at 200bht/night for a dorm bed, but it’s 100% worth it. First off, it has the most magnificent view. 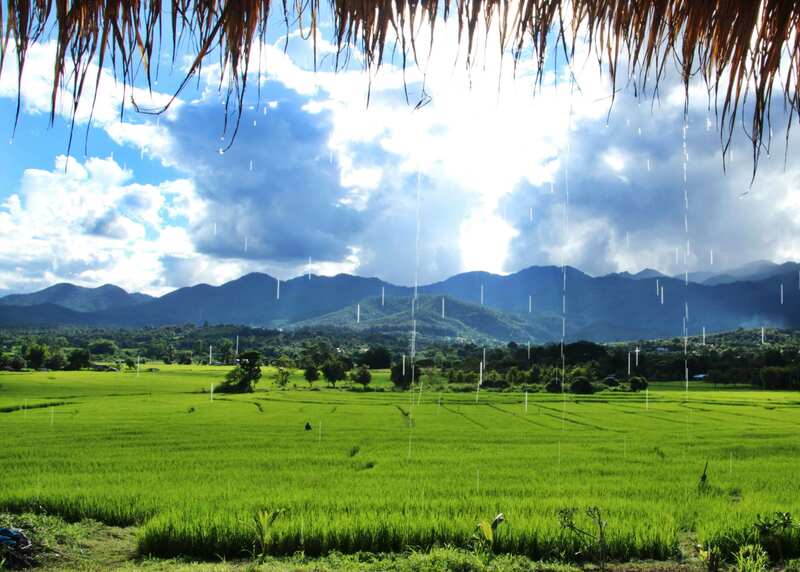 The open-air common area looks out over harlequin rice fields with lofty mountains looming in the distance. The dorm beds are some of the most comfortable we have ever slept in and the bathroom is ridiculously nice; complete with granite countertops and everything. We were fortunate enough to meet the owner of Deejai Pai during our stay. To Korn (pronounced “Gone”), Deejai isn’t so much a hostel as it is a way for him to fund his community outreach program. Korn works hand-in-hand with local farmers, educating them on the dangers of pesticides, and helping them make the transition to organic farming. He’s lost several family members to pesticide related illness, and works passionately towards changing the farming culture in Pai. A large portion of the rice field next to Deejai Pai is organic rice; it’s pretty amazing to see how Korn’s efforts are paying off. On our last evening, they prepared a tasty barbeque all with vegetables from his organic garden. Beyond the comfort and quality of the hostel itself; we highly recommend staying at Deejai Pai because your tourism dollars spent here are reinvested into the local community. Be prepared for serious curves! 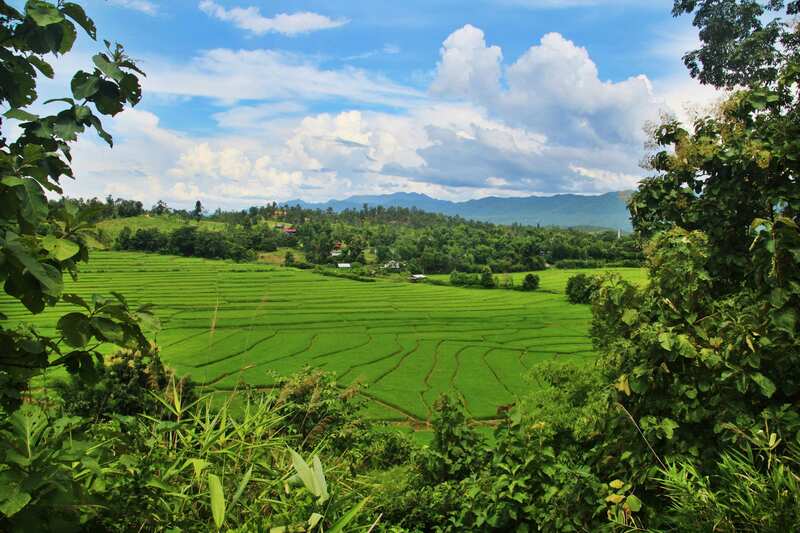 We loved Pai so much that we briefly flirted with the idea of canning our trip and staying there. But we were committed to our quest, and set off towards Mae Hong Son with the promise that we would return to Pai again in the future. The first part of the drive winds up yet another mountain pass with a nice scenic area on top to take a break and enjoy some freshly brewed coffee. The drive to the top gets chilly so make sure to have a long shirt or jacket handy. We made our second stop of the day at the Tham Lod caves. 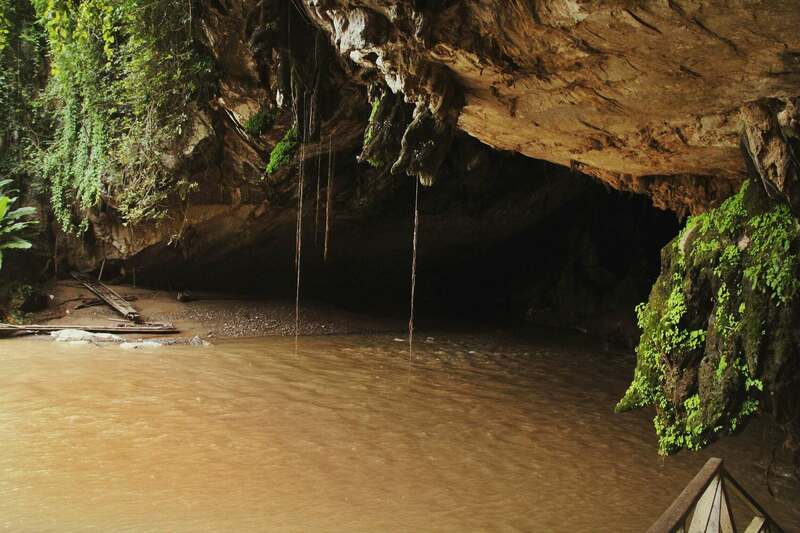 Located about 50km north of Pai, Tham Lod is a complex of massive caves with a river flowing through the central chambers. You enter the caves via bamboo raft, then explore the interior by lamplight; passing massive limestone formations along the way. There are normally three caves you can raft through, but the water levels were too high and we could only enter the first cave. It costs about 100baht/person to see the caves and is definitely worth the detour. After Lod cave, the mountains melt away into rolling farmland and tranquil forests. 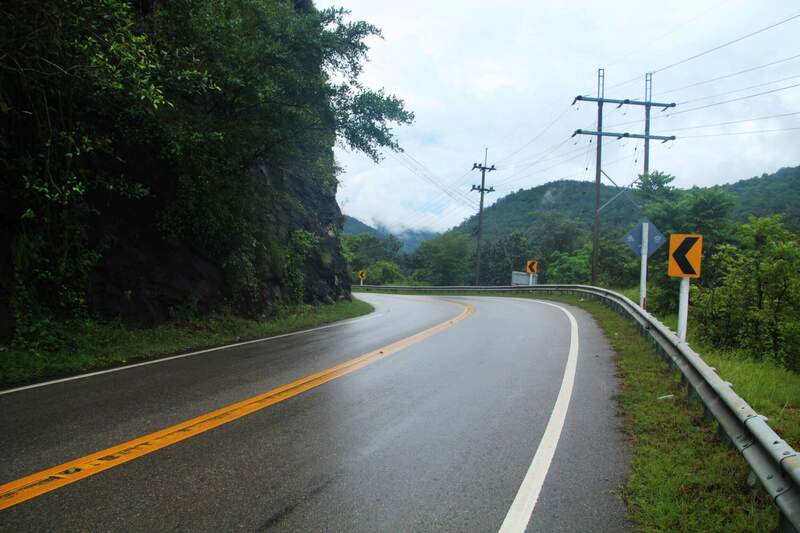 The stretch between Pai and Mae Hong Son has some of the most dramatic scenery of the whole drive. It took us about 6 hours to get to Mae Hong Son from Pai, but we were in no rush. We spent over an hour at Tham Lod and made numerous stops to take pictures and enjoy the scenery. After a lazy morning in Mae Hong Son, we made the hour drive up to Ban Rak. The afternoon was spent wandering through tea plantations, relishing Chinese food, and sipping on delicious tea. On the way back to Mae Hong Son, we made a stop at the Poo Klon mud spa. The full mud spa experience was a little out of our price range, so we paid 120bht for mud facials. Neither of us had been to a mud spa before and it was definitely a cool experience. Our faces left feeling refreshed and energized. We drove into Mae Hong Son as the sun was setting and made the quick drive up to Wat Phrathat Doi Kongmu to watch the sunset. The temple rests on a hill overlooking the town. The more actively inclined can hike to the temple, but there’s a road you can drive to the top. The temple features two beautiful, white chedis, along with 360 degree views of the surrounding countryside; making it a great place to watch sunrise or sunset. Poo Klon on the road to Ban Rak, but we passed two other mud spas on the drive into MHS the night before that might be cheaper. 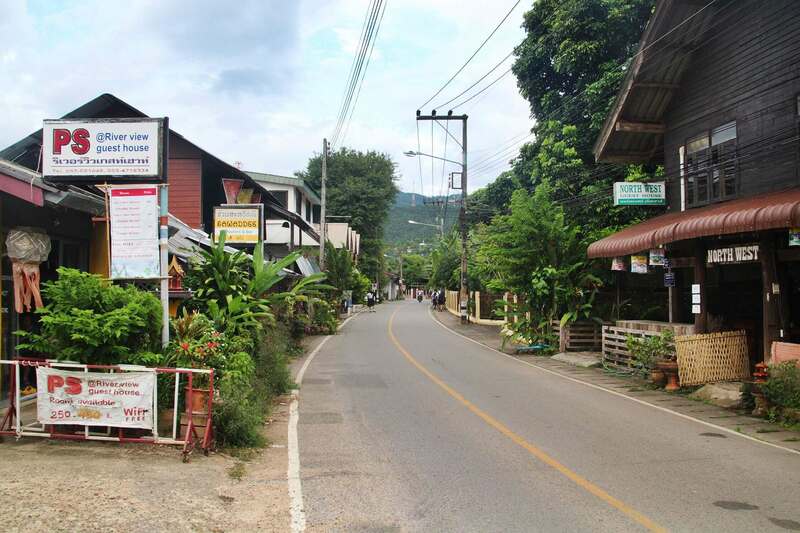 Just keep an eye out on the right side of the road (coming from Pai) when you’re about 20km outside of Mae Hong Son. We stayed at The Like View Guesthouse located on Chong Kham lake in the center of town. The location is great, the coffee is good, and the owners are really sweet. You can also set up activities like trekking and hill tribe visits through this guesthouse. Unfortunately, the room was small and hot, and the bug net barely fit over the bed. It felt a bit overpriced (300bht/night) for what we got. Chong Kham lake is lined with guesthouses; if you go there and shop around you can probably find more comfortable or cheaper options. On the road to Mae Sariang is Mae Surin National Park, at the heart of which lies Mae Surin Waterfall: the highest falls in Thailand. Our original plan was to stop and explore the national park, potentially even camping for the night at the waterfall. However, some unexpected detours altered our plans. We had to drive 45km back towards Ban Rak to retrieve Ashley’s Hydroflask, and then spent another hour driving up this sketchy mountain road that dead-ended in a farm (thanks Google maps). By this time, the day was getting late and we had no choice but to drive straight for Mae Sariang. If you want to go to Mae Surin, don’t listen to Google maps. Just drive south from Mae Hong Son for about 65km (100km if coming north from Mae Sariang) and you will see a big sign for the turn off to Mae Surin. Along this same road is the Bua Tong sunflower field, which blooms in November and December. If you’re navigating the Mae Hong Son Loop during that time of year, it’s an absolute can’t miss. Another worthwhile stop we didn’t have time for is Mae La Noi: a small town 30km north of Mae Sariang. Just outside of town is a hill tribe village with a coffee plantation and amazing hand-made goods. There you can learn how coffee is made, sample the coffee, and support the community by buying handicrafts. To find the village, just drive to Ma La Noi and ask some of the locals, they will be happy to point you in the direction. Detours included, we spent over 8 hours driving this day, with very few stops. We rolled into Mae Sariang as the sun was setting with sore bums, feeling very ready to be off of the bike for a day. 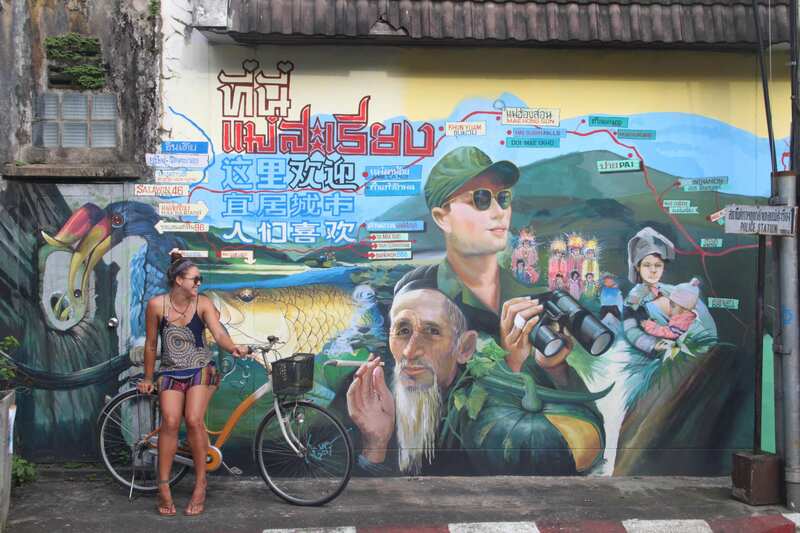 We found some unexpected street art in Mae Sariang! Mae Sariang is an endearing town with friendly locals and a laid-back vibe. Chances are you’ll be some of the only foreigners in town, so don’t be surprised to receive stares, big smiles, and animated waves as you explore around. 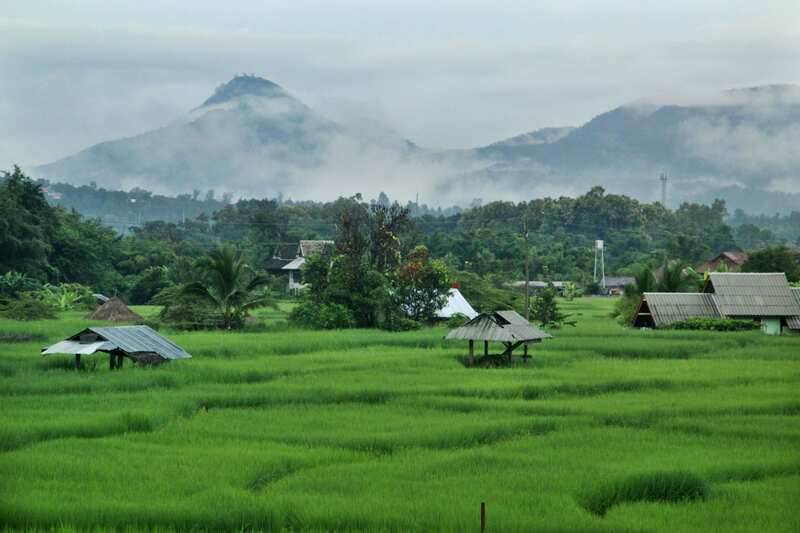 Though it has a sleepy feel to it, Mae Sariang serves as an excellent launching point for a bevy of outdoor activities. 7km west of Mae Sariang, you’ll find Salawin National Park. Here you can hike, camp, and raft along the Thailand/Myanmar border. This area is also, said to have some of the best trekking in north Thailand; you can hike to surrounding hill tribes that haven’t been influenced by tourism. Within the town itself you can visit several beautiful temples, check out the morning and night markets, and relax by the Yuam river. Just outside of town is Phrathat Chom Thong; a hillside temple with a large, golden Buddha overlooking the valley. The views from the Buddha are spectacular, making it the perfect spot to take in a sunset. 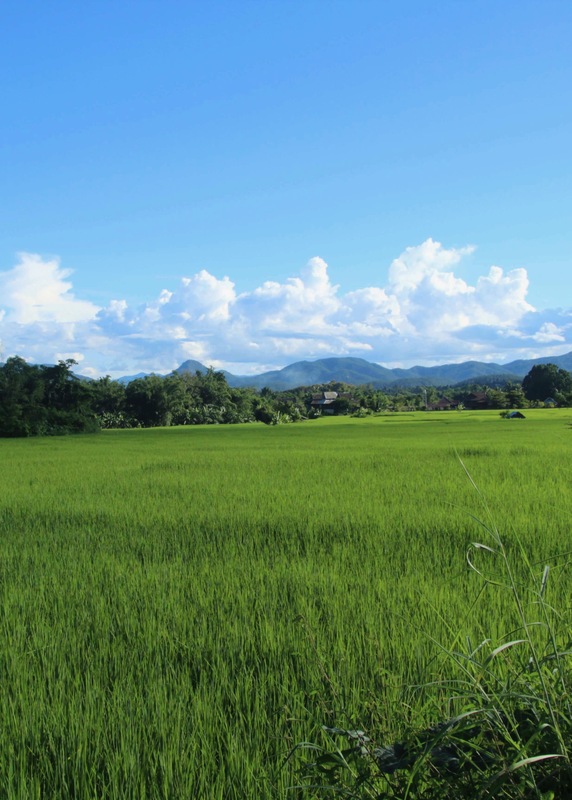 Unlike similar areas in Pai and Mae Hong Son, you’ll probably have the view all to yourselves. Mae Sariang isn’t on the tourist radar, so there isn’t much information readily available on the internet. To find out more information on things to do, your best bet is to ask some of the locals. A good place to start is at Northwest Guesthouse, they organize single and multi-day treks. 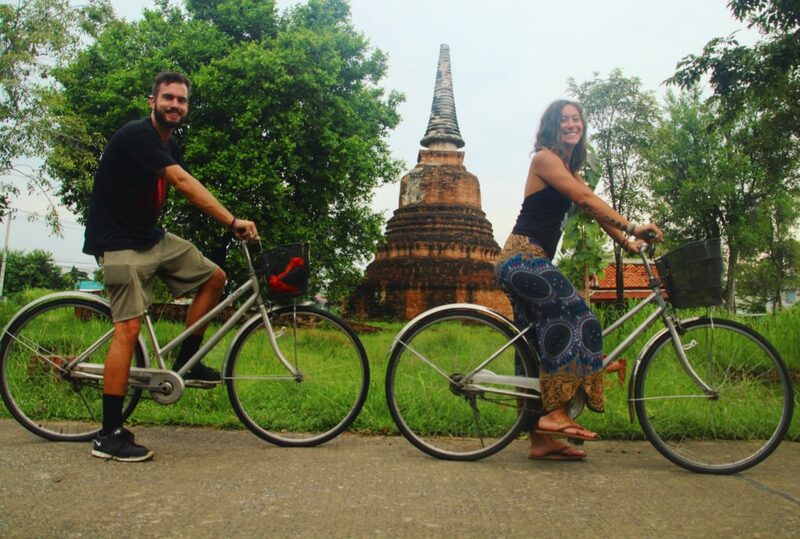 We spent our day in Mae Sariang exploring Salawin National Park in the morning, then renting bicycles and riding up to the golden Buddha for sunset. After the long drive the day before, we were thankful to be off of the scooter and give our sore butts and backs a break. We stayed at the Riverview Guesthouse in a private room with fan for 350bht/night. It has a great location overlooking the river, a water jug to refill bottles (yay! ), and the owner can give you advice on organizing activities. Across the street from Riverview is Northwest Guesthouse. They have budget rooms from 200-300bht/night and you can organize trekking through them. There are guesthouses all along the river so you have plenty of lodging options to choose from. The final leg of the Mae Hong Son Loop is the longest distance-wise but the easiest to navigate. About halfway through, the winding mountain road fades away and is replaced by a two-lane highway where you can blast the rest of the way to Chiang Mai at 80+ km/hour. We woke up to a chilly morning in Mae Sariang, bundled up in our warm clothes, and hit the road by 9am. After driving for around 20 minutes we came to the realization we had forgotten to fill up with gas before setting off. We were getting dangerously close to running out of gas when we came across a self-service pump, and had to fork out 38bht/liter (almost double the regular price) to fill up. The first proper gas station is about 100km outside of Mae Sariang with only expensive self-serve pumps in between. Learn from our mistake and be sure to fill up before leaving Mae Sariang. About 20km outside of Mae Sariang, you have the option to stop at Mae Sawan Noi waterfall and neighboring hot springs. The waterfall is supposed to be a beautiful series of 7 falls and pools perfect for swimming. We had plans to take a bus later that evening so we decided to pass on the falls and press on to Chiang Mai. Shortly after the turn-off for the falls, it started to rain with torrential ferocity. It rained and rained with no sign of letting up. Though layered in rain jackets and ponchos, we shivered as we inched down the road; driving through squinted eyes in futile attempt to see through the pelting rain. At one point, we stopped at a café to warm up and seek respite from the downpour. We must have looked totally pathetic dripping wet in our ponchos, because the owner of the café gave us from some tea and cheese toast while we waited out the storm. It finally stopped raining about 90km outside of Chiang Mai and we cruised the rest of the way, rejoicing to have the warm sun on our faces. If you have time, I would highly recommend a detour coming to/from Mae Sariang to visit Doi Inthanon National Park. The scenery is amazing as you wind up the road to the highest point in Thailand. There you’ll find the twin pagodas built in honor of the King and Queen, along with some astounding views. Inside the park are countless hot springs and waterfalls, amazing local fruit and produce (keep an eye out for mangosteen wine!) and several places to camp. The entry fee is a little steep for our standards at 300bht/person, but it’s well worth a day trip, especially if you end up camping. We had already made a day trip to the park while staying in Chiang Mai so we skipped it, but Doi Inthanon is a worthy addition to your Mae Hong Son Loop itinerary. The final sunset of our incredible journey. 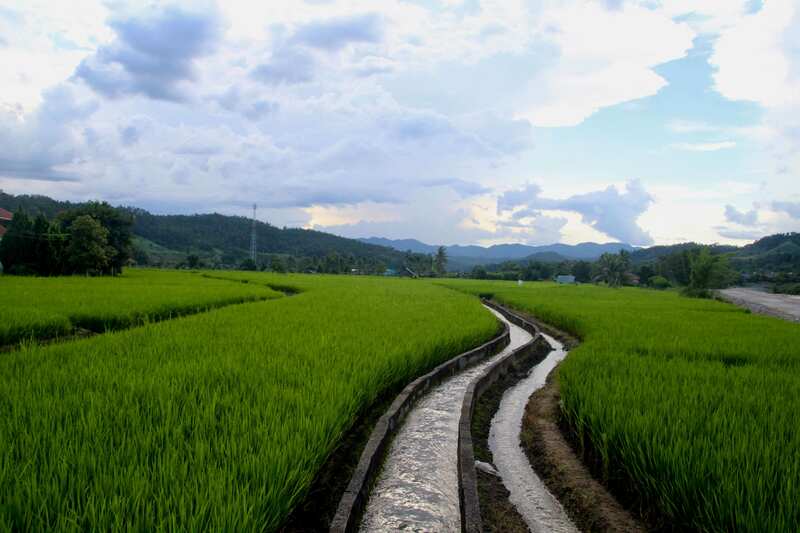 Circumnavigating the Mae Hong Son Loop is one of those experiences that really allows you to be a traveler. 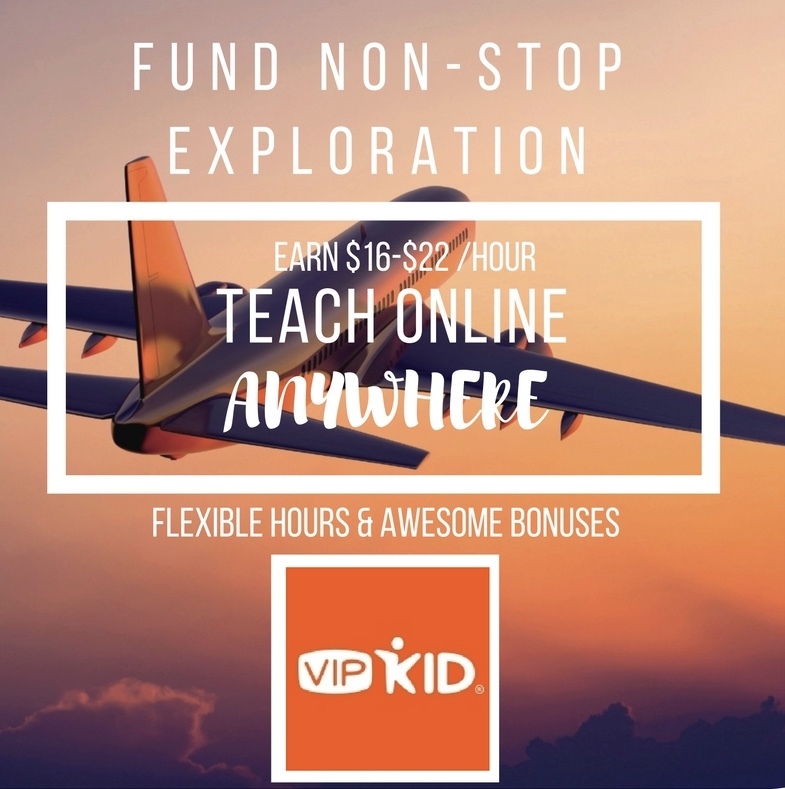 You get the opportunity to connect with locals, venture far beyond the trodden tourist trail, and visit places untarnished by commercialism. Along the way you’ll eat amazing food, meet fascinating people (locals and foreigners alike), have epic adventures, and witness moments of beauty that are sure to take your breath away. I can think of no better way to get personally acquainted with the magic of north Thailand than by hopping on a scooter and spending a week (or preferably more) cruising the 1864 curves of the Mae Hong Son Loop. Make sure your scooter comes with insurance. That way if something happens to you or the scooter, you’ll be covered. Rent a big bike (150cc or larger) to power you up those mountain roads. Also make sure it has comfortable seating, especially for the passenger. You’re going to be spending a lot of time on whatever scooter you choose: it’s worth the extra money to get a better bike. Make sure your speedometer, gas gauge, lights, turn signals, and horn are all working properly and that your tires are fully inflated before leaving Chiang Mai. Bring rain jackets/ponchos and put a pack cover on your bag when driving. In all likelihood, it will rain at some point; the last thing you want is to have all your clothes be soaking wet. Complete the loop in no less than 7 days. That way you won’t have to drive on consecutive days. Get an early start. Try to be on the road by 10am at the latest on driving days. If you’re late getting started, you’ll run out of daylight for stops along the way and find yourself merely driving from point A to point B. This takes away a lot of the fun of travel days and can turn the driving into a grind. Take turns driving and give yourself plenty of opportunities to rest. This will make the journey so much more enjoyable for both of you. Make sure to fill up on gas, take out cash, and top up your mobile data (if needed) before driving to the next city. Facilities are limited in between the main towns on the loop. Pack sunscreen! Driving all day is a long time for your face and arms to be exposed to the sun. You don’t feel the sun as much when you’re driving because of the wind, and if you aren’t careful you’ll find yourself with a crispy nose at the end of the day. Have a long shirt, sweater, or jacket easily accessible when driving. It gets chilly driving up the mountain passes in north Thailand. The temperature changes during the day can be dramatic, especially in the winter. Your left brake should be the primary brake used when going down hills. It’s the rear brake and generates the most stopping power. Instead of continuously holding the breaks going downhill, use a squeezing motion to apply and release pressure to the breaks in short spurts. This will control your speed while preventing your brakes from overheating. If you feel your brakes getting weaker, they may be overheating. Pull over and give them time to cool down. Pouring water on the brakes will help as well. Drive on the left side of the road and try to stick to the outside of the lane around blind curves. Van drivers in north Thailand are maniacs. They make liberal use of the opposite lane when passing cars at 80km down steep mountain roads. If you feel lost, stop and ask a local. They will be more than happy to point you in the right direction. We packed light, only bringing one daypack worth of clothes for the both of us. Less weight= increased fuel economy. We rented a newer/more fuel-efficient motorbike. Our activities on days off included more hiking/walking/bicycling, and less motorbike driving. We found places in each city to refill our water bottles instead of buying plastic ones, and brought our own silverware and straws to cut down on plastic waste. We drove a total of 821km on just over two tanks of gas; averaging 81.5mpg (34.7liters/km) for the trip. We used our total distance and mileage to calculate our carbon emissions for the week. After calculating our footprint on three different websites, our emissions came out to an average of .06 metric tons. To help offset our emissions, we paid a self-imposed carbon tax through The Nature Conservancy. The carbon tax is a donation based on the size of your emissions that the Conservancy uses to fund conservation projects around the world. They suggest donating $15/metric ton of emissions to offset your carbon footprint. Though we only generated a fraction of that, we decided to donate $30 to counteract the emissions from our trip. We know this isn’t as good as not driving a gas-powered vehicle at all, but we think it’s a step in the right direction as we strive to be more sustainable travelers. Thanks for this post. Haven’t found many where people went 2-up. It’s good to know it is possible on a scooter. A concern for my wife and I is that it would be over 400lbs for the 2 of us, my fault mostly. Did you find the scooter ever struggling with 2-up and your gear? Taking 2 scooters isn’t really an option as my wife has no motorbike experience and she’s pretty nervous of the idea of motorbiking in Thailand in general. Thanks for any advice over what’s already in your post. The Honda PCX are big, beefy scooters so I think they can handle the weight. We never had problems with the two of us on it. We left most of our things at a hostel in Chang Mai and just brought what could fit in one 32L backpack and under the seat of the bike so we didn’t have a ton of extra weight. My concern for you guys would be comfort when riding on the bike. On days you are traveling make sure to get up early and take lots of breaks! I would recommend going to Tony’s Big Bikes and getting their advice, but as far as power goes you guys shouldn’t have any problem!